Saina Nehwal made a rampaging start to her London Olympics build-up by winning the Thailand Open last week and the Indian ace will now look to test her game against the Chinese when she starts her campaign in the Indonesia Super Series Premier in Jakarta on Wednesday. The World No. 5 one of the medal contenders for India at London, clinched her second title of the season in Bangkok last week and she will open her campaign against Japanese Sayaka Sato in the first round in Jakarta. Saina has a 3-1 record against Sato, the only loss being at the Korea Open last year. Once she crosses the first hurdle, the Indian will play a qualifier in second round but her real challenge will start from the quarters, where she is likely to meet third seed Chinese Shixian Wang. "Indonesia would be very tough, I am playing Sato from Japan in the first round and all the Chinese would also be there. It would depend on that particular day and how you are feeling. 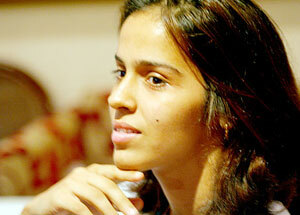 I can't promise a title but I can promise to give my best," Saina said. Indonesia Open will also see the return of other Olympic bound shuttlers such as P Kashyap, Jwala Gutta, Ashwini Ponnappa and V Diju competing with the best in the business. In men's singles, Parupalli Kashyap will be up against Guatemalan Kevin Cordon but the Indian has a tough draw as he will meet top seed and World No. 3 Chen Long of China in the second round. The only Indian who will compete in two events in the Olympics, Jwala also has a tough task at hand in the mixed and women's doubles competition. Jwala and V Diju will open their campaign against Yeon Seong Yoo and Ye Na Jang. The Korean pair had beaten the Indian combo in the China Masters last year. The Arjuna Awardee will also pair with Ashwini in the women's doubles competition and the combo will have a tougher competitor in their opening round in second seed Chinese Qing Tian and Yunlei Zhao. Among others, Ajay Jayaram, who lost the Olympic berth to Kashyap at the last moment during the Indian Open, will take on Viktor Axelsen of Denmark in the opening round, while rising shuttler P V Sindhu will face off Maria Febe Kusumastuti of Indonesia. In mixed doubles competition, Tarun Kona and Ashwini will take on Riky Widianto and Puspita Richi Dili of Indonesia, while Tarun Kona and Arun Vishnu will be up against third seed Mathias Boe and Carsten Mogensen of Denmark. In women's doubles, Pradnya Gadre and Prajakta Sawant will meet a qualifier in the opening round.